The man-made bend in Mill Creek. MYCB photo by Dan Thesman. WALLA WALLA, Washington – There’s an above normal snow-pack in the Blue Mountains and that means the U.S. Army Corps of Engineers is keeping a close eye on the amount of water the melting snow is producing. As part of that, he monitors the jet stream in the Pacific Ocean. 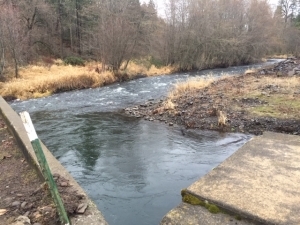 Snow-melt is a given and Hall said that will cause higher flows in the Mill Creek channels. As the Corps continually monitors Mill Creek, Hall said water will be diverted to Bennington Lake if flows exceed 1,400 cubic feet per second. Hall said that’s when the Corps starts to see damages downstream, mainly erosion to the channel banks beyond the leveed sections of Mill Creek. Filling Bennington Lake for recreational use will probably happen in mid to late April.